Having - and following - a thorough agenda is an important key to facilitating an effective meeting. 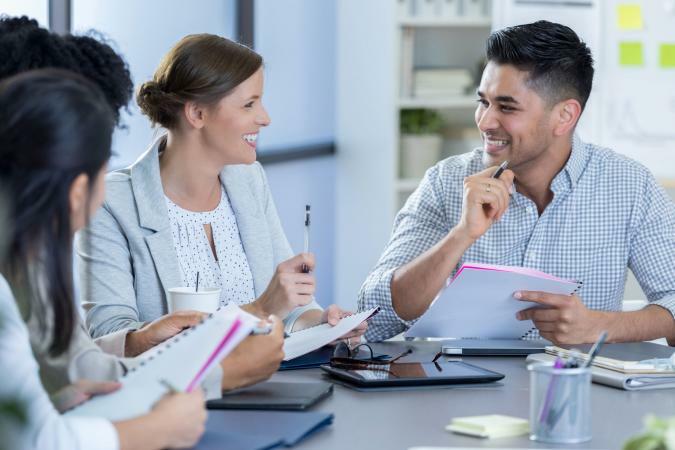 Whether you are in charge of a one-time gathering or responsible for heading up a recurring meeting, it is critical to put together an agenda in advance and to use it as a guide for the actual meeting. Fortunately, you don't have to start from a blank screen every time you need to create this type of document. Using a pre-formatted template such as one of the options provided here is a great way to simplify the process of organizing the necessary information. 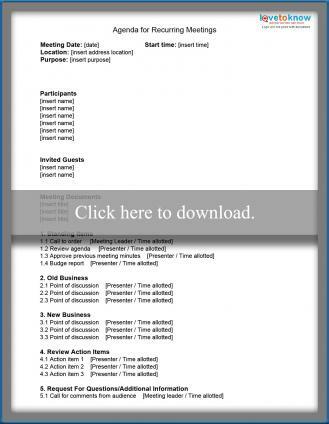 The two printable meeting agenda templates provided here are designed to be edited and customized to meet your specific needs. The basic meeting agenda (top image) is suitable for one-time meetings, while the agenda for recurring meetings is appropriate for groups that meet periodically (such as committees, regular staff meetings, etc.). Note: You will need a PDF reader to open and edit the document. If you do not already have a reader, visit Get.Adobe.com/reader/ to install a free version. 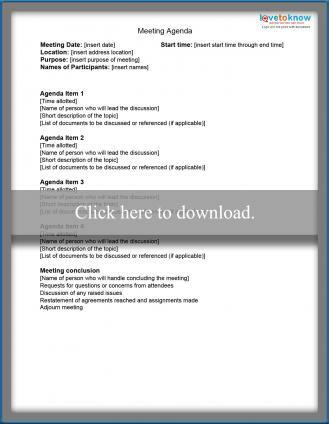 Download a basic meeting agenda. Download a recurring meeting agenda. To download the template of your choice, simply click the image for the type of agenda that meets your needs and the document will open as a PDF file. Proofread carefully, being sure that you have included all relevant information and that the document is error free. Once you have completed the agenda with the information you need, save the document again (using the instructions in item 2). U.S. Department of State - Visit this link to see sample outlines of agendas appropriate for executive team and work team meetings, as well as a few designed for use in a school system. The agendas are not provided as fill-in forms, but if you see a structure that you like you could copy the format into a word processing document and adjust to meet your needs. SkillsUSA.org - Visit this site to see the recommended agenda format for a SkillsUSA chapter meeting. The format could be adapted to work as a framework for any professional or civic organization. The agenda is presented in a PDF format, but is not set up to be edited electronically or transferred into a word processing document. If you want to use this format, you'll need to re-create it in a blank document. LawLatte.com - If you like the idea of using an agenda template where the time limits are very prominent, the sample agenda provided at this website is a good option for you. The time limits for each item are shown very prominently in the left margin, inside text boxes for emphasis. Like the one above, it is set up in a PDF file that can't be edited, so you'll need to re-create it in your own word processing program if you'd like to set up your own agenda in a similar fashion. Once your agenda has been finalized, distribute it to each person expected to attend the meeting in advance of the meeting time - ideally three to five days in advance. This will allow participants time to prepare, which can ensure that the actual meeting goes as smoothly as possible. On the day of the meeting, distribute a copy to each attendee upon arrival and use the document as a checklist as you proceed throughout the discussion, keeping to both the order information is discussed and the allocated time.